Art Woods is an associate professor in the Division of Biological Sciences at the University of Montana, in Missoula. He first came to FHL in 1993 to take a Larval Ecology course from Richard Strathmann as a graduate student at the University of Washington, and has been back numerous times. Amy Moran is an associate professor in the Department of Biology at the University of Hawai’i. In the 1990s she came to FHL first as a postgraduate, then as a graduate student, and later as an FHL Postdoc. She too has made frequent research visits since then. Scared of spiders? Perhaps that fear nudged you away from terrestrial biology and into marine biology in the first place? If so, sorry; there’s no escape. The world’s oceans are home to a diverse group of eight- (or sometimes ten- or twelve-legged) creatures known as sea spiders, or pycnogonids. 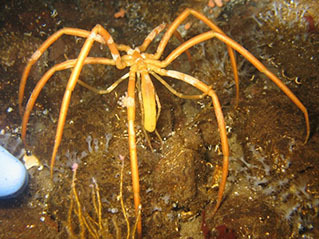 There are around 1300 named species of sea spiders, and probably many more yet to be discovered. They live almost everywhere: in intertidal and near-shore subtidal habitats, on coral reefs, in deep benthic habitats including the oceanic abysses, and in polar waters. Despite occurring in so many habitats, sea spiders are obscure, which is to say underappreciated, because most of them lead secretive lives. In the waters around the San Juan Islands, pycnogonids are very small and camouflaged and it is a lucky Invertebrate Zoology class that finds some for lab. The largest local species have leg spans of a few centimeters and the smallest ones only a few millimeters. The most abundant pycnodonids in the area at the moment, species of Achelia, creep about and are difficult to see (at least if you’re older than 40) on SCUBA even with one’s facemask stuck right next to their preferred hydroids (Figure 1). Fig. 1: A local Achelia on a hydroid. Can you see it? Over the past 100 years, the phylogenetic affiliations of pycnogonids have been hard to pin down. The current quasi-consensus is that they are a basal sister group to the chelicerates (arachnids and horseshoe crabs). This means that sea spiders are not true spiders, but they’re reasonably close. But not to fear! None of the species deliver poisonous bites and they don’t have piercing jaws. Rather, they have a fleshy proboscis with a 3-part mouth at the end, which they use to grind up and ingest their prey. The prey themselves are usually soft-bodied things that don’t run away when the sea spider arrives. These include hydroids, anemones, tunicates, and some worms. Sea spiders are strange in many ways. They have highly reduced bodies and long legs, so much so that from a distance they look like a collection of legs walking along without a body. They have weak circulatory systems and appear to get most of their oxygen by simple diffusion across the cuticle, with little oxygen circulated by the blood. Perhaps because of their weak circulation, they also have local delivery of goods and services – their digestive systems, gonads, and other organ systems are distributed down into their legs. Finally, males play a significant role in delivering parental care to offspring. Females attach egg masses onto the male, often onto specialized legs called ovigers, and the male carries the egg mass around until the larvae are ready to take off on their own. Fig. 2: A large Antarctic pycnogonid. The blue object on the left is the gloved finger of a SCUBA diver. You can see the large proboscis sticking off the front of the sea spider. Photo credit: Bruce Miller. Despite their strange obscurity, sea spiders exhibit a spectacular biogeographic pattern that forms the basis of our study; some species at the poles are giants (Figure 2). This pattern, called polar gigantism, is common across marine invertebrate taxa. Species that live in temperate and tropical waters are small-bodied, whereas their relatives at the poles are much larger. For example, local pycnogonids around Friday Harbor have leg spans up to a centimeter, but many polar species' legs span easily 30 centimeters or more. These polar giants are conspicuous and dominant members of the benthos in the Ross Sea, around McMurdo Station in Antarctica. Our NSF-funded project (Office of Polar Programs) is taking a comparative and physiological approach to examining patterns of body size evolution in pycnogonids. We’d like to know the physiological and biomechanical bases of gigantism. Why are pycnogonids (and other organisms) so much larger in the Antarctic? During the evolution of large body size, how do physiological and biomechanical traits of the sea spiders change? Are temperate and tropical pycnogonids constrained to be small by abiotic or biotic factors? Our main working hypothesis is that very cold temperatures in Antarctic waters alter the oxygen physiology of marine invertebrates in ways that favor, or at least allow, gigantic forms to evolve. All aerobic marine invertebrates face the problem of having to extract scarce oxygen from seawater and then deliver it throughout their bodies to the tissues that are using it. An organism has to be in oxygen balance, at least over the long term – meaning it takes in just as much oxygen as it uses up in its metabolic processes. 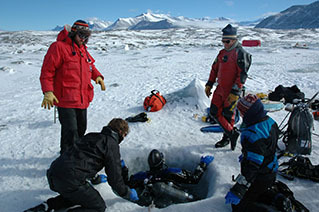 Cold water shifts that balance, mainly by depressing metabolic rates to very low levels so that a given gram of Antarctic tissue burns oxygen much more slowly than a given gram of temperate or tropical tissue. Cold water, however, also supplies about the same amount of oxygen by diffusion. Thus, in cold waters, demand for oxygen decreases a lot while diffusive supply stays about the same. We think this allows the evolution of large forms because it’s much easier to stay in oxygen balance, even if the organism is giant and has tissues that are a relatively long way from its diffusive surfaces. Fig. 3: A dive site in New Harbor, on mainland Antarctica. Photo credit: Bruce Miller. A related thread in our research, led by our colleague Bret Tobalske at the University of Montana, is to examine the biomechanical properties of pycnogonids and how those properties scale across body sizes. It’s known in terrestrial vertebrates that skeleton mass scales such that large vertebrates have disproportionately large skeletons; a shrew’s skeletal mass accounts for about 4% of its body mass whereas an elephant’s accounts for 28%! We’re asking similar questions about pycnogonids: how much larger are the forces experienced by large pycnogonids, and how do the mass and materials properties of the exoskeleton scale across body sizes? This is also important for thinking about oxygen physiology, as we think there may be a tradeoff between evolving a cuticle that allows oxygen through easily while also resisting the mechanical forces imposed from the environment. Fig. 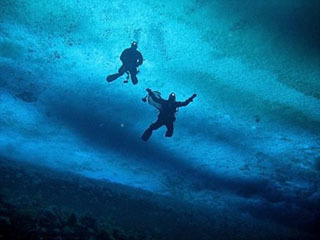 4: Two divers under the ice, as viewed from below. Photo credit: Rob Robbins. 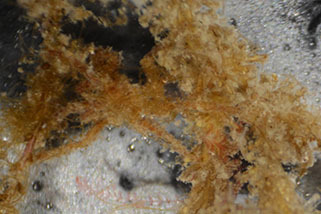 To explore these ideas, along with our students Steve Lane and Caitlin Shishido, we are examining the details of oxygen transport and use by small, temperate pycnogonids at FHL and in Hawaii, and by giant pycnogonids in the Ross Sea around McMurdo. We plan to measure their metabolic rates (as a way of estimating how fast they consume oxygen) across a variety of temperatures, look at the details of how readily oxygen diffuses across the cuticles, examine patterns of blood circulation, and measure both the forces they experience in the wild and how those are related to the bending and stretching properties of the cuticle. To get access to the large Antarctic pycnogonids, we’re traveling to McMurdo Station in October and November of this year. There, we’ll collect pycnogonids from the benthos by SCUBA diving below the sea ice (Figures 3 & 4). We’ll take those sea spiders to the Crary Laboratory, a well-equipped lab building on the station with running seawater tables much like those at FHL, to carry out most of the experiments. Have we caught you in our web of intrigue? Most of this work is just getting underway, so we don’t have any answers yet: ask us next year! Moran A.L., and H.A. Woods. 2007. Oxygen in egg masses: interactive effects of temperature, age, and egg-mass morphology on oxygen supply to embryos. J Exp Biol: 210 (722-731). Moran A.L., and H.A. Woods. 2012. Why might they be giants? Towards an understanding of polar gigantism. J Exp Biol: 215 (1995-2002). doi: 10.1242/jeb.067066. Woods H.A., and A.L. Moran. 2008. Temperature-oxygen interactions in Antarctic nudibranch egg masses. J Exp Biol: 211 (798-804). Woods H.A., Moran A.L., Arango C.P., Mullen L., and C. Shields. 2008. Oxygen hypothesis of polar gigantism not supported by performance of Antarctic pycnogonids in hypoxia. Proc Roy Soc B: published online. doi: 10.1098/rspb.2008.1489. Look for Tide Bites in your inbox at the start of each month! To view previous Tide Bites, visit the FHL archive page located on the FHL website.